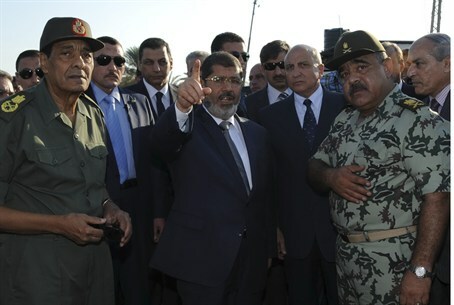 Egyptian President Mohammed Morsi visits Sinai, a day after 16 Egyptian soldiers were killed in a terror attack in the region. Egyptian President Mohammed Morsi visited north Sinai on Monday night to offer his condolences to Egyptian soldiers stationed at the border. According to a report in the Egyptian-based Al-Masry Al-Youm, Morsi vowed to avenge the deaths of the 16 soldiers who were killed in Sunday night’s terror attack in the region. Morsi was accompanied by Field Marshal Hussein Tantawi, Interior Minister Ahmed Gamal Eddin and intelligence head Mourad Mowafy. He visited a battalion near the Arish airport and then addressed a battalion near the headquarters of the governorate. The report said that Morsi told the soldiers that Tantawi has issued orders to avenge the deaths of their brothers-in-arms and to secure the border area. He added that they had issued instructions to counter attacks on security forces. Presidential spokesperson Yasser Ali told Al-Masry Al-Youm that Morsi came to monitor the search for the attackers and assured that they will be found and punished. He added that Morsi met with security heads in the area to discuss tightening control and eliminating criminal activity. Meanwhile, U.S. Ambassador to Egypt Anne Patterson released a statement condemning the incident and expressing her condolences to the victims, their relatives, Morsi and the Egyptian people. Patterson added that she hopes the perpetrators of this “cowardly” act will be brought to justice.